Sweet Salvage on 7th: Got Junk! I see mirrors, tool caddy and marble top for a cute table!!! Hope you are having a great weekend and will try to visit your store next time you are open. I live in Tucson, so I have to schedule a day trip or a weekend trip to Phoenix!!! Well, I certainly think that oval marble piece would make a great grave marker when partially buried in the ground. Or a great table top! That old trunk would be great full of vintage clothes to use as dress up for Halloween. The mirrors could be decorated with fall flowers, pheasant feathers, or webs. If some of the silvering is gone off the back of the mirror, you could put a spooky image behind the glass peeking out when you ask "who's the fairest of them all?" Do I see an old metal bin that could be used to hold fall flowers or harvested items like gourds, pinecones, potatoes??? Wish the picture was bigger. 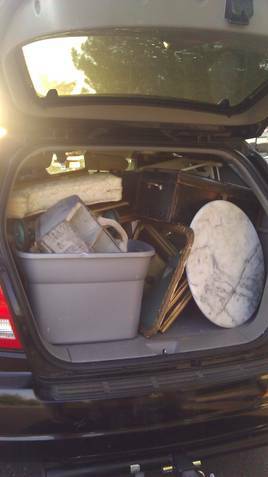 It's hard to tell what some of the stuff is -- other than the obvious, chairs, cushion, frames, mirrors, marble top, tin bin, trunk, turquoise wheels to something. a suitcase, picture frames, mirrors, a trunk, a roosting crate for chickens or a tool caddy, a cushion, a printers tray (i'm hopelessly obssesed! )and lots of goodies in that Rubbermaid container. I see the beautiful trees through the window of the opened hatch....could it be this vehicle is somewhere where the leaves change color on those trees?